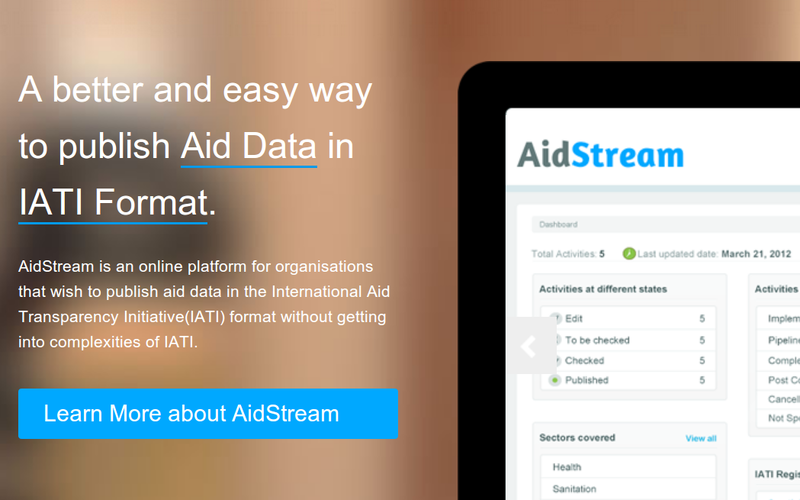 A month ago, on April 8th, I helped a group of Dutch NGOs get to grips with AidStream, as part of the Partos IATI programme. As always, it’s very informative to see unsuspecting users try to make sense of a new tool. It resulted in a list of observations, often easy fixes, that can make life a little easier or more pleasant. That same week, the AidStream code base was published on Github, and I had a chance to participate in the team check-in, and report a bunch of these observations as issues. The workflow status “Edit” is now called “Draft”, to avoid confusion with the action “edit”. When you add a new activity, you now see descriptive values (“Reporting Organisation Type: National NGO”) instead of code list values (“22″). The template file to upload transactions works properly now (you actually can choose a simpler template now as well). Your own internal reference numbers for transactions are now shown in the transactions list. The exotic “Linked Data Default” field is hidden (at the moment, only Unicef seems to publish this, with value… “”). So if you participate in the Partos programme, and use AidStream: tell us what you like and what confuses you. There’s a good chance you’ll see your feedback incorporated in the next version soon!